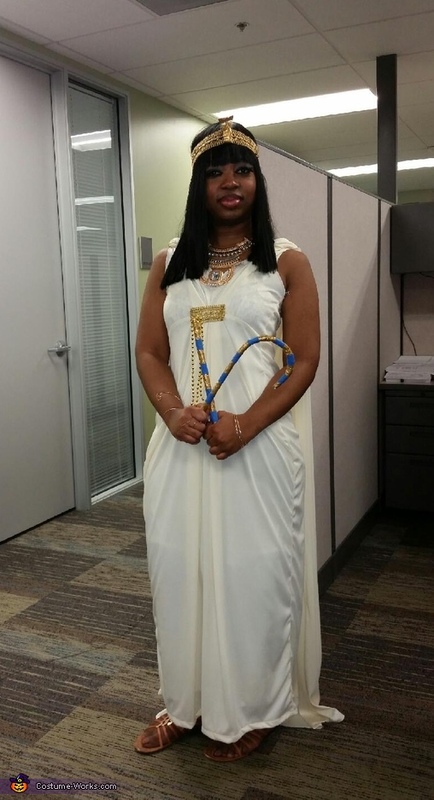 This homemade costume for women entered our 2015 Halloween Costume Contest. I am wearing my own creation of Cleopatra: Egyptian Royalty. My necklace was purchased through ebay for about $7, everything else was made from scratch! My dress and cape took about 5 yds of one way stretch knit fabric purchased at my local fabric shop on sale for about $4/yd. My headband was crafted from trim that was purchased by the yard. The snake piece that adorns the headpiece was crafted from gold duck tape and flexible yet stiff jewelry wire which can also be purchased by the spool for around $6. I created my own wig from hair that comes on a "track" at my local beauty supply store and with my sewing machine, i sewn it to a wig cap. My crook and flail is a giant plastic candy cane broken in half for about 98 cents. To give it that "egyptian flare ", i wrapped it in gold duck tape and put pieces of blue painters tape around to finish it off. All in all with the wig it cost less than $50 for the entire costume!i had a blast making it!